Ondeh-Ondeh have been my favourite nyonya kuih since my younger days. I still remember I will buy this ondeh-ondeh in my school canteen almost everyday. At that time, they sell six ondeh-ondeh for only 20cent, that's really cheap!!! ☻ The ondeh-ondeh I used to eat is the one made from glutinous rice flour dough wrapped with chopped Gula Melaka which is totally different with the one I make today. 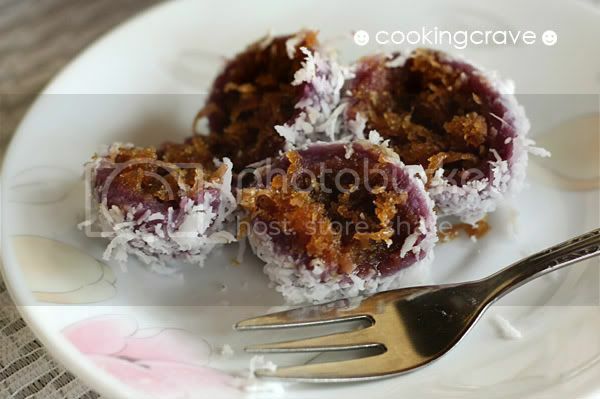 I came through this special sweet potato ondeh-ondeh with coconut fried with gula melaka fillings recipe at Baking Mom and decided to give it a try. 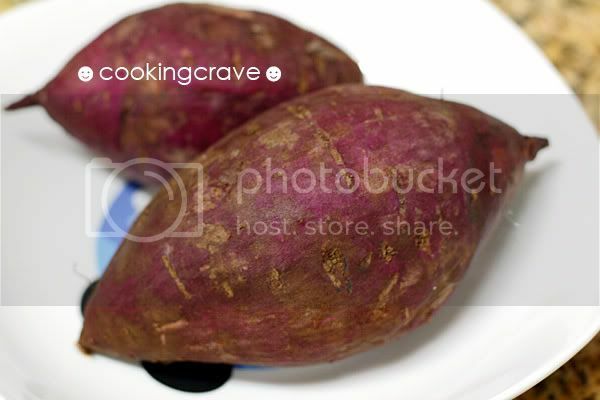 I use the purple coloured potato to make my ondeh-ondeh. I always prefer the purple fleshed sweet potatoes, it's soft and sweet. We can just steamed or grilled it and eat them topped with some honey or sugar. Boil a big pot of water. While waiting for the water to boil. In a big bowl, mix mashed potatoes, tapioca flour, sugar, pandan juice and knead it into dough. Add water 2 tbsp at a time, slowly knead the until the dough are soft not too dry or sticky and can roll into a ball. 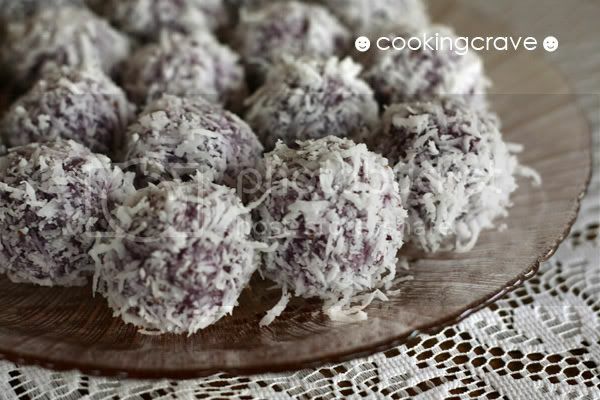 Roll the dough into small ball, flatten and put the fried coconut filling in it. Wrap it up nicely and roll it again. Continue to do this until the dough are finished. Put the wrapped ondeh-ondeh into the boiling water and cook. When the ondeh-ondeh floats to the top, the dough is cooked. Roll the cooked ondeh-ondeh in the steamed white coconut shreds. Cook and stir the chopped gula melaka, sugar and water in low heat till dissolved. 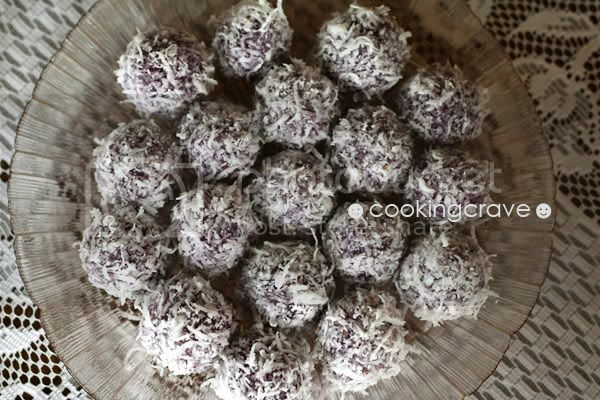 Sift the sugar mixture onto the shred coconut, add in salt and continue cook in the low heat. Pour in the corn flour mixture and continue to stir till the coconut sugar mixture thicken. Leave it to cool a bit before use it. This is my favorite nyonya kuih too! I miss this so so much! My stomach are growling really loud now, thanks! FedEx some this way please! wow u know how to make this even! too bad i don't eat them one.. if not will be fun making it too. Looks great. Is it possible to stash them in a freezer? What is ur verdict on onde onde made with sweet potato mixed with glutinuous rice flour and those made using sweet potato mixed with tapioca flour. 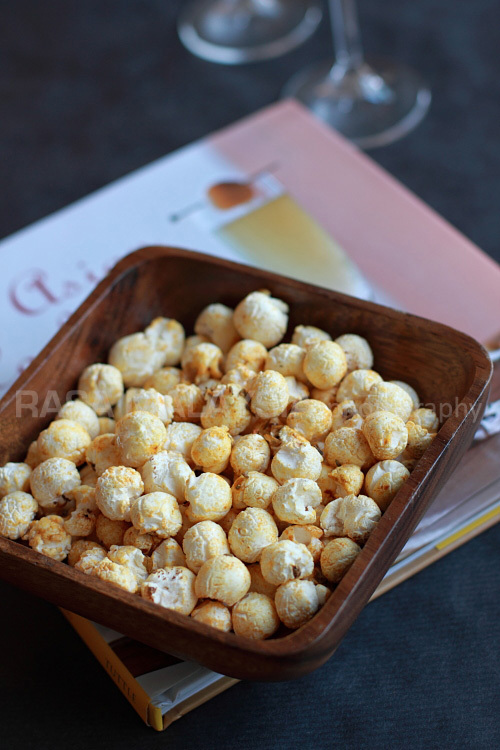 There are many recipes out there with either sweet potato mixed with glutinous rice flour or sweet potato mixed with tapioca flour and I often wonder which flour to mix that will make my onde onde taste better. Cud u kindly advise me which flour to use to mix with sweet potato that will make my onde onde taste better. There are many recipes out there that have sweet potato mixed with glutinous rice flour and some versions used tapioca flour mixed with the sweet potato.